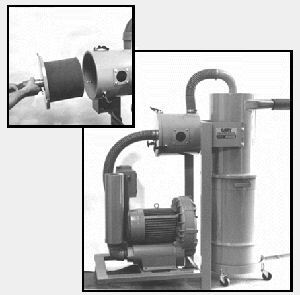 The Cary Cyclo-Separator/Filtered Vac System was designed for industrial and commercial applications requiring powerful and efficient cleanup of dirt and/or heavy materials. The Cyclo-Separator removes most dirt, dust, or other materials and drops them into a 30 gallon receiver that is mounted on a drum dolly for ease of dumping. Both portable and stationary systems (as shown) are available. Any carry-over dust is filtered by a highly efficient pleated filter element. The standard filter element filtration is 99% @ 10 micron. A 4 micron or HEPA filter is available . Waste Capacity, Cu. Ft. 30 Gal. 30 Gal. Dimensions (LxWxH) 56" x 24" x 66" 56" x 24" x 66"